2. Pastel yellow blazer can be worn atop light gray T-shirt half-tucked in white bootcut jeans. Complete this outfit with black leather heeled sandals and a structured handbag. 3. 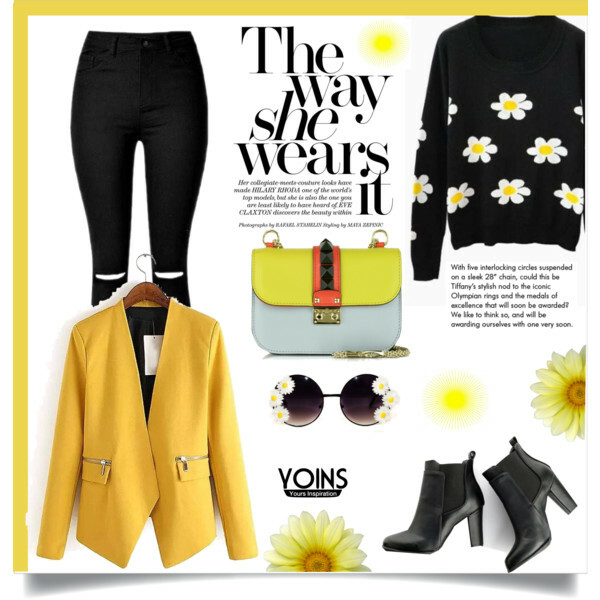 The Rich yellow blazer makes a wow statement with a white shirt, black leather skinnies and platform heeled pumps in black color. 4. A light yellow double-breasted blazer can be used as a sophisticated layering piece. 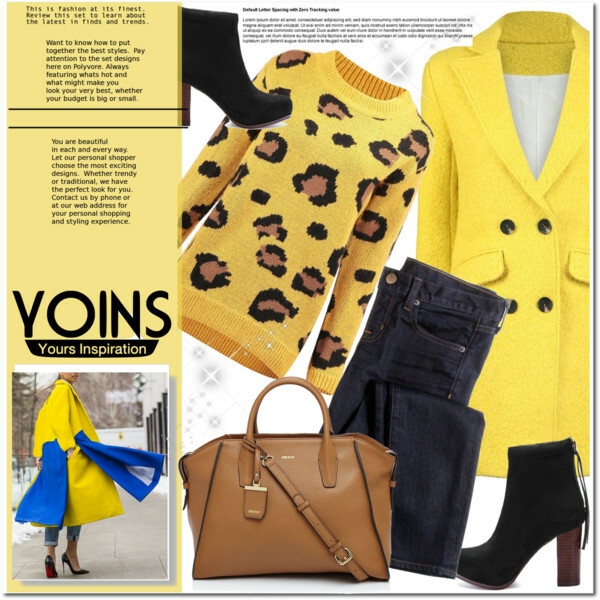 Add an animal print yellow sweater, dark blue jeans and suede ankle boots in black color. 5. 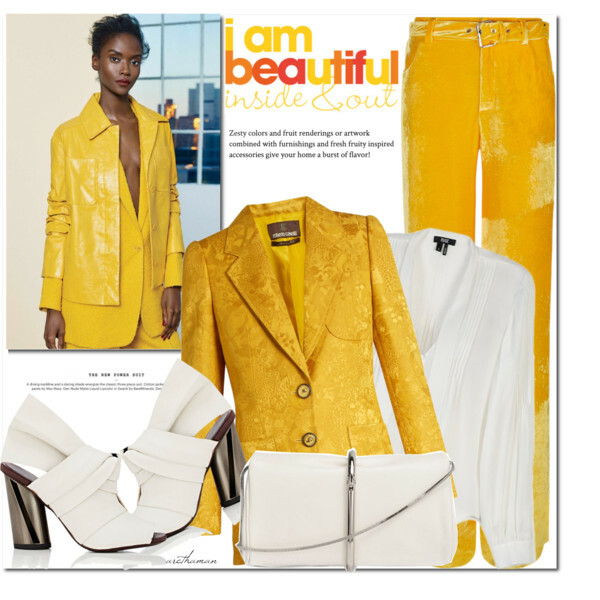 Tailored jacquard print yellow blazer can be teamed with velvet yellow trousers and crispy white wrap blouse. 6. A funky style yellow pantsuit updated with a black fedora hat, black slip tank and platform heeled sandals. 7. For a casual day off you can try on a pastel yellow blazer with a lightweight white wrap blouse and ripped boyfriend jeans. Complete this look by adding animal print heeled sandals and black leather bag. 8. Another simple combination is showcased below. Add blue skinny jeans, white shirt, light gray pullover and shiny silver flat pumps. 9. How about all black under a yellow blazer? I see black knee-ripped skinnies, black sweater printed in daisy print and Chelsea heeled ankle boots. 10. If you are not into pants, then I recommend you to add a sleeveless white blouse and tuck it inside floral print dark blue high-waisted flared skirt. Add patent yellow heels and dark blue leather handbag. 11. 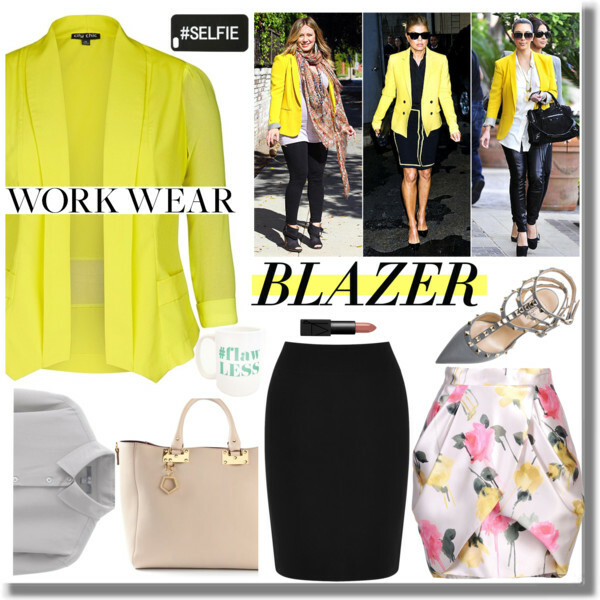 A neon yellow blazer can be used during office hours. Add a cream-gray shirt and black pencil skirt. 12. I do love to see yellow blazers worn with floral print dresses. 13. Floral print tube skirt and black slip tank ideally match yellow blazer and heeled pumps. 14. You can make your cocktail outfit look bright and feminine! Go for a pink lace frock and layer it under a yellow blazer.